on the left immediately after going through the second gate as there is no way through further on. The farmer is quite OK with our activities but asks that we don't climb over walls and fences. Take off at the very top of the hill. Alternatively, you can use the field to the left of the walk up path - there's a small group of trees in this field not far from the fell wall. NO SCRATCHING near to sheep and lambs - stay well away from all livestock. 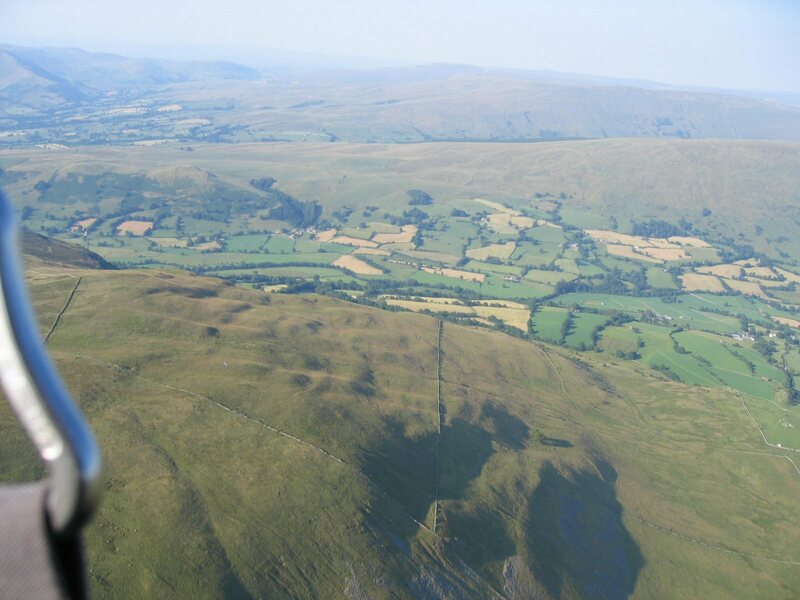 There is a number limit of ten people on the fell, flying or otherwise. DO NOT walk through, land in or over-fly the field marked as 'out of bounds'. No flying is permitted within two hundred metres of the Combe (NE bowl) during the nesting season. Limited roadside parking. DO NOT obstruct the road or field gates. No school use. An excellent site consisting of a grass and heather covered ridge that extends for 6km. The carry up is steep in places and sustained however the effort is well worth it. The site can be silky smooth or gut wrenchingly rough. The bridge at Gawthrop about 1 mile to the North East and down the hill from the car parking. Leave the A65 at Kirby Lonsdale and travel north approx. 4km to Barbon to the east of the A683. Pass through Barbon village heading out on the minor road towards Gawthrop and Dent. This road passes up through Barbondale with the main ridge of Barkin rising steeply on the left. Limited parking can be found in the side of the road before it drops steeply towards Gawthrop. From the parking area, follow the footpath through the gate into the field beyond. Contour around the hillock and once through the next kissing gate, look for a gate on the left and go through it. With the fence on your right, head for the small enclosure of trees up on the fellside. A set of vehicle tracks mark the route up. 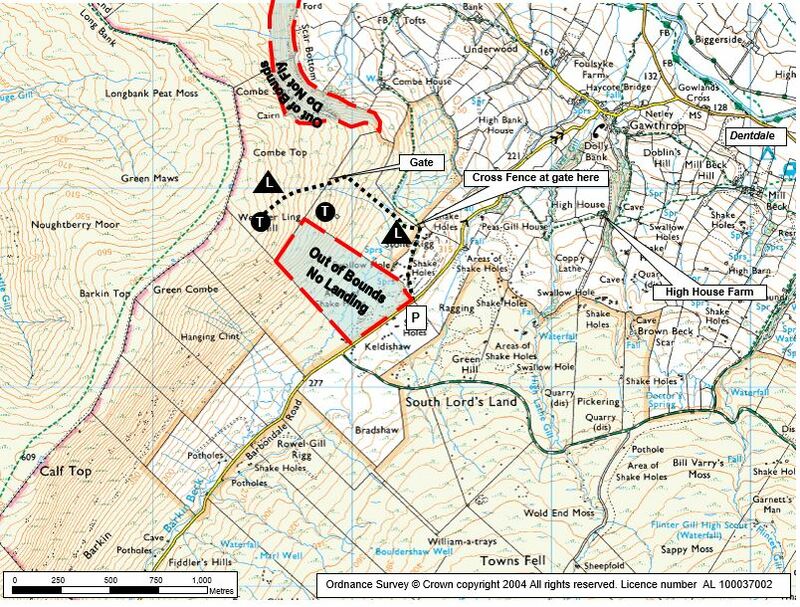 The take off area is close by the small enclosure or above the next wall out on the open fell. DO NOT take off or overfly at low level the field immediately to the right of take off (looking away from the hill). Beware of a marked wind gradient and do not be tempted to take off low down in less than ideal conditions. The area behind the ridge is full of deep gulleys and getting blown back is not an option! The site can become very thermic particularly over areas of scree. 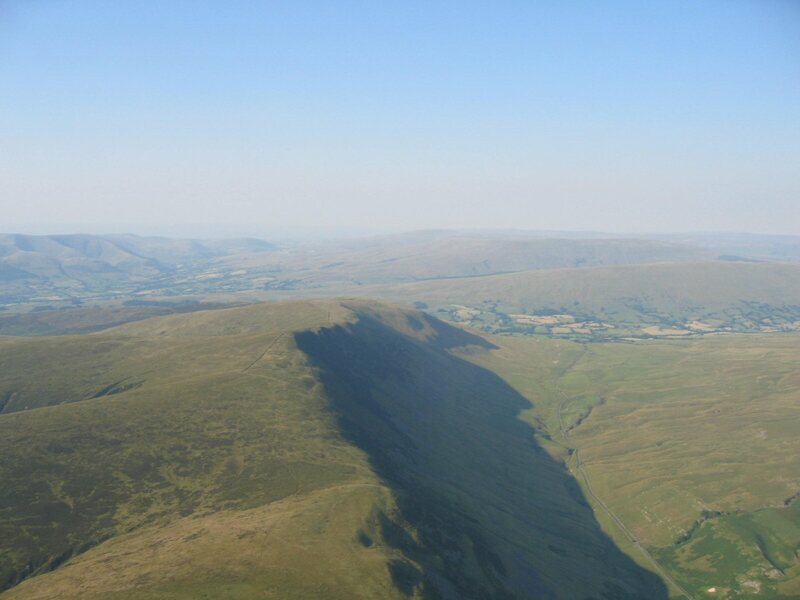 Military jets use the area mid week and have been known to fly along the valley at below ridge top height. The site can be affected by sea breeze that causes the wind to rapidly switch such that it then blows over the back. A windsock in the landing area is definitely recommended. Wave does occur occasionally when it can be very bouncy and very nice depending on the day. Any where from the small clump of trees upwards. It is easier and better to check the breeze higher up so the best take off is above the top wall. Land in the bottom a bit soggy, or by the Limestone outcrops in the field just by the road. Avoid the out of bounds enclosure the farmer is not very supportive. Can be rough coming into land if there is any sort of breeze. A wind sock is very useful. 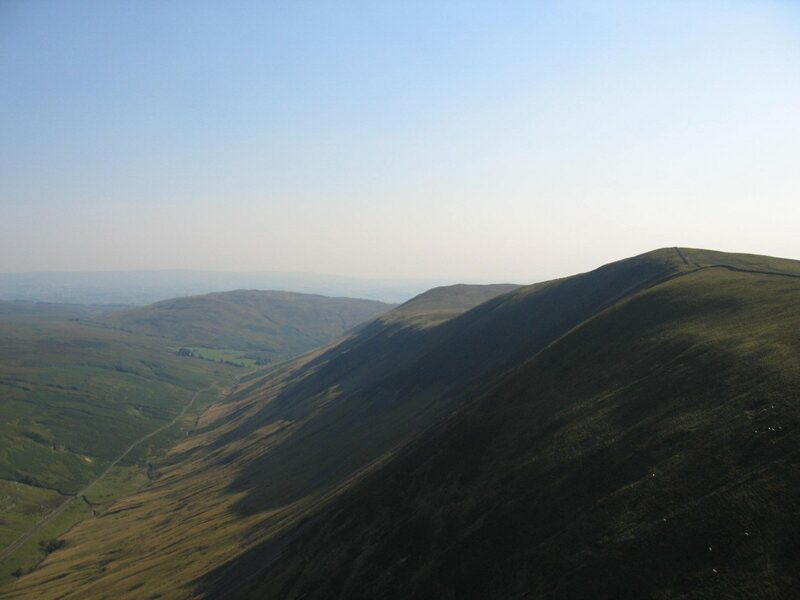 Big ridge with lots of potential, good down wind routes into the Lakes and up along the M6. Can be very strong and thermic with wave potential. Don't flop over the back low down it's a long walk and very sinky. Excellent evening soaring up and down the ridge. The NE bowl used to be flown but recent conservation efforts make this too intrusive for the wildlife. Good pub in Barbon village. Excellent. The coast at Ravenglass lies approximately 60km away and a more northerly track leads to the Scottish borders. Looking down on the take off area which is in the walled area in the middle and left of picture. The area close to the wall running across the picture is used above the area of shadow. 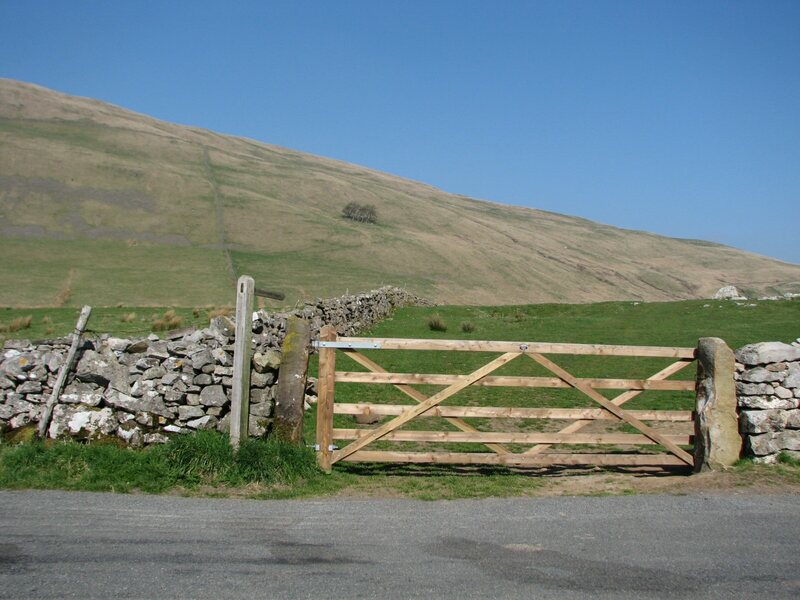 In Spring 2009 Andy Plimmer and Ed Cleasby rebuilt the gate from the road. The old one was in a poor state and the new one is a fine job. Andy reports that getting the gate posts in was a bit of a challenge! Notes : Right in the centre of Dent village. Excellent beer! Notes : On the next corner east from the Sun Inn, this pub is owned by Dent Brewery - excellent beer. Notes : Bit of an uninspiring pub on the A683 north of Kirkby Lonsdale.This is the nearest pub if you're heading back west from the site.